"Where once again evil giant sharks haunt the Brody family, this time chasing the now adult sons to Sea World!! In eye-popping 3-D!!" When I recently saw the 70's folk horror classic Let's Scare Jessica To Death, it got me to look up the director (John D. Hancock) to see what else he had done. When I learned he was originally hired to direct Jaws 2, and then promptly fired after just a short while, it was all I needed to finally dig into this series of films that before now, I really had no interest in. Jeannot Szwarc (Supergirl) would ultimately replace Hancock on Jaws 2, and it would become another monster hit, and not surprisingly, the first of a string of sequels, and a decrease in quality with each new entry. I kind of left Jaws 2 feeling it was just the same story all over again. What's more, I was frustrated at the storytelling in general. I won't get into it here, but there were a lot of things I didn't really like about it. But I figured since I made the effort, I might as well keep up the momentum, especially since they're all on Netflix at the moment. I better use the opportunity before they disappeared. 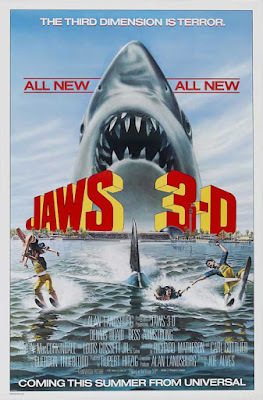 Knowing that Jaws 3D has been pretty much been mocked and derided relentlessly, I was actually looking forward to it. I knew it would be cheesy, I mean, that one clip of the shark smashing through the window is legendary, and if that was any indication, Jaws 3D could potentially be some good 80's cheesy fun. What also sold me was that Jaws 1 and 2 production designer Joe Alves (Escape From New York. Close Encounters of the Third Kind) was making his directorial debut here. I think having someone who had worked on the production of the first 2 films come into this one as a director was a bold, yet smart move. Having worked alongside Spielberg and Szwarc, he brings with him an insiders knowledge which would really be beneficial. I for one was excited to see what he could bring to the table. Plus, I was curious just how "3D" this was going to go. So let's dig in. I couldn't believe it, but I actually legitimately enjoyed this one. In fact, I enjoyed it far more than the second one. And there are a lot of reasons for that, namely being that I felt Joe Alves did a far better job behind the camera than Jeannot Szwarc did with the sequel. Sure neither of them reach Spielberg level of visuals, but Jaws 3D certainly delivered some solid eye candy in a way that the second one couldn't, which is hard to believe since Szwarc was a far more experienced director and this was Alves one and only stint as a director. It also helps that it's changed locations, which helps a lot here. Changing the location and scenery from Amity to a high-tech Sea World Theme Park via 1983 was an awesome idea. This new theme park, owned and run by a New Orleans investor (who clearly doesn't know the first thing about safety or proper protocol), contains large sections under water where the park visitors can walk through glass tunnels with the aquatic wildlife literally floating all around them. It's a cool concept for an underwater theme park that's made a reality through hilariously awful green-screen effects. But I have to give them props for the idea and execution. A lot of model work was implored for these scenes (especially from the outside looking in) and you have to wonder how great all that would have looked had this film been made just 5 or 10 years later. I'll bet it would have looked badass. But that's just me. But it's these terrible effects that make this one so enjoyable for me, in a cheesy 80's sort of way, which is usually the best kind of cheese. I mean, you just can't take it seriously to begin with, right? Just the idea alone (a different monster shark murdering people in each film) is silly, but throwing in the 3D angle (which, when you actually watch the film, is totally unnecessary), and the change of location to Sea World really steps it up several notches to cheesy awesome. They ultimately tie this entry with the previous films by making the Brody kids from the first two entries the main adult characters here. Yes, that's right. Mike and Sean Brody are all grown up and working at Sea World in some other part of the U.S., to escape the memories of what happened to them many years earlier. Only, there's another giant shark, and she's snuck into the Sea World facility with her babies, and she's angry. I'm telling you, this just keeps getting better and better. Seriously, complain all you want about the quality of this film, but you can't say that it's not fun. Because it is. If nothing else, it's fun and for me, the most entertaining of the bunch. I haven't checked out Jaws 4: The Revenge yet though, so you never know. Aahh, the year of 3D. What a year 1983 was. Do you remember? I sure do. Sure we've had 3D pop in and out of pop culture for many, many decades, but 1983 was really the defining year for that little niche market. That year saw a flurry of 3D marketed films, some successful, most not, so naturally the producers, or the studio (not sure which) wanted to ride that wave of success and popularity following the footsteps of films like Amityville 3-D, Metalstorm 3-D, Spacehunter 3-D, Treasure of the Four Crowns 3-D, and not to mention Friday the 13th Part 3: 3-D just the year before. Only, director Joe Alves did not want to go that route. His protests fell on deaf ears and the powers that be demanded it, and so Alves was forced to include 3D shots into the film, and it's painfully obvious that this film was not meant to be in 3D. For starters, they are very few and far between (I can only imagine the annoyance of having to wear those glasses for large chunks of the film that feature zero 3-Dimensional effects), and with the exception of maybe 2 or 3 shots, you just don't get the sense that the whole 3D angle was on the forefront of this film's production. With that being said, the big money-shots (albeit less than a handful) are pretty laughable with the main image (pictured above) of the shark crashing through the window of an underwater structure being the defining moment of bad effects and bad 3D of this era. And just wait till the last 3D moment. It's........awfully good. Despite this popular cash-in, the film still manages to be loads of fun from start to finish, and that's a major feat all in itself. Now, I wanted to quickly point out a few things I loved about this, even if it only furthers my case that it's cheese. The shark, for whatever reason, growls under water. In the third act, every time it's shown on screen or makes its appearance, it lets out a tiger-like growl and it's so dumb, but also awesome. I loved that stupid decision. There was also a moment about halfway through where the shark surprises someone underwater and eats him. This time though, director Joe Alves shoots most of this sequence from the perspective of inside the sharks mouth and it was freaking killer! I'd never seen that before. The camera is inside the mouth looking out while it's chomping down on a human body with blood flowing everywhere and it kind of blew my mind. I also really loved the underwater model work. Taken out of the 3D concept, it's pretty impressive. You can't help but wonder how great this could have been had it had some much better composite shots. The cast is also pretty solid. I've always loved Dennis Quaid. The guy can do pretty much anything, and the New Orleans investor played by Louis Gossett Jr. is the antagonist the story needs to drive so many of the dumb decisions along, so that the shark can do what she needs to do, which is eat each and every human she sees. Bess Armstrong (My So-Called Life) probably walks away the most liked here, being strong, confident, brave, smart and cute. It's a pitty that Joe Alves never directed again. His work here far surpasses Jeannot Szwarc's ability behind the camera and given the material, he did a better job than you would have expected. It's not a great film by any stretch of the imagination, but it sure is one helluva fun one. 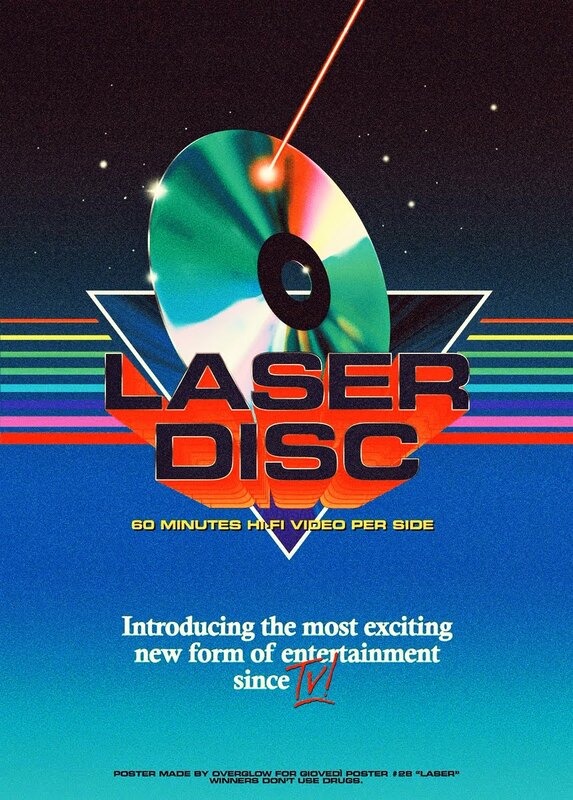 Shut off your brain and enjoy this slice of 80's cheesy goodness. In 3D or not, it doesn't make a bit of difference. It's still fun either way.